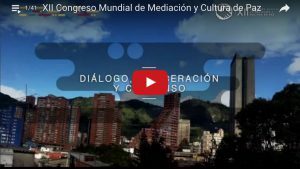 Follow live the most important conferences on issues of mediation and reconciliation at the XII World Congress of Mediation and Culture of Peace. The event, organized by the Chamber of Commerce of Bogota, through its Center for Arbitration and Conciliation, in partnership with the University of Sonora in Mexico, the Mediation Institute of Mexico and the International Centre for the Study of Democracy and Social Peace, will bring together more than 1,000 people in five cities, to discuss dialogue as the best tool to resolve conflicts in society. While Bogota will be the epicenter of Congress, cities such as Medellin, Cali, Barranquilla and Buenaventura will also host different events witrh the presence of renowned personalities such as John Paul Lederach, an expert on peace building, and Christopher Moore, an expert in collaborative conflict resolution who will give their views on how to achieve reconciliation. During the six days of the Congress, dialogue, deliberation and consensus will become the common denominator of an academic agenda with the active participation of entrepreneurs, NGOs, the Government and citizens, in addition to the academic community. This event is the ideal place to raise awareness of the importance of solving everyday conflicts through peaceful alternatives and mediation. The Congress will also address the advantages of associative dialogue in the sectors of mining and energy in projects in vulnerable areas of the country, and will analyze the relevance of mediation and conciliation to public, private and social institutions. For mor information, see: www.congresodemediacion.com.